down into four sections to be transported to a new site Planning on moving to a better site in the next couple of years. The design is built around a freestanding central truss across the middle of the workshop to which the four section of the workshop are bolted. Each section of the workshop includes a floor section side and end wall and roof (when the sections are moved these will have to be supported with braces). It will be another month or so before the interior of the workshop is completed so a little longer before we get back to the roadster. 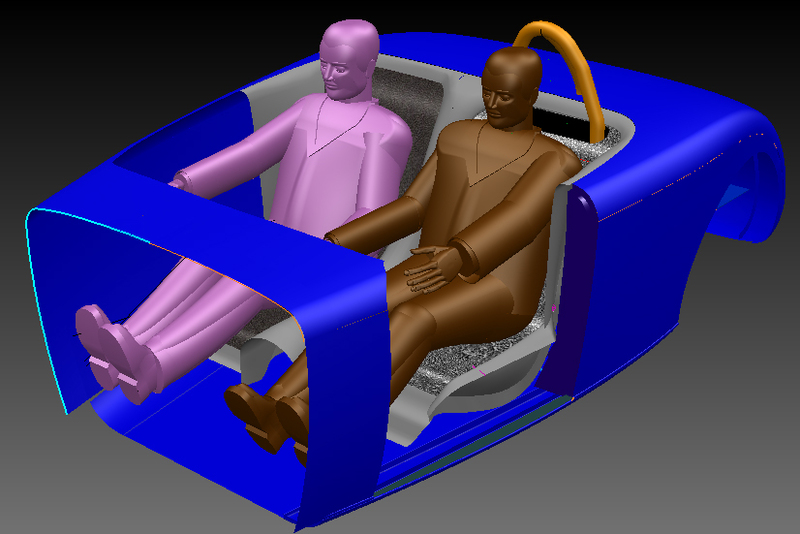 Looking forward to building up the basic frame and seating to test that it is comfortable before designing to much more, may be the steering wheel mounting need to be designed first. 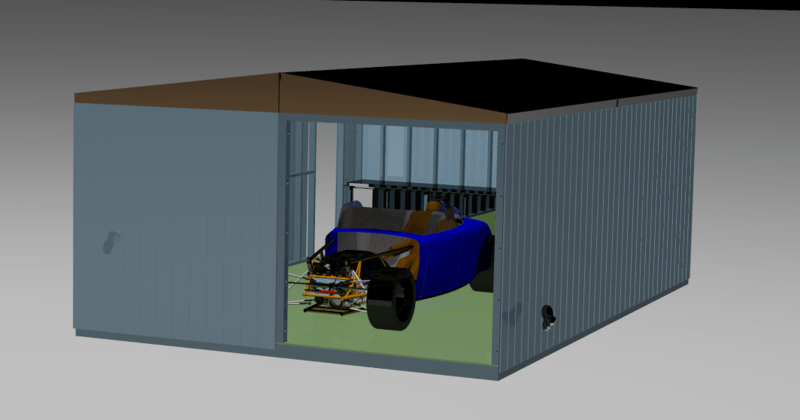 The car has got to be drive-able, so we wanted to do some full scale testing to be sure…..hence the workshop. Firstly sorry for the lack of updates in the last months, we have been building as extension of our development workshop in Florida, adding an extra 800 sq feet for chassis building and it has taken all our spare time to get the new concrete floor in. Taking a break as it is recommended that you allow 28 days for the concrete to cure and evaporate water contained in the concrete before sealing, so a little time to progress the roadster design. 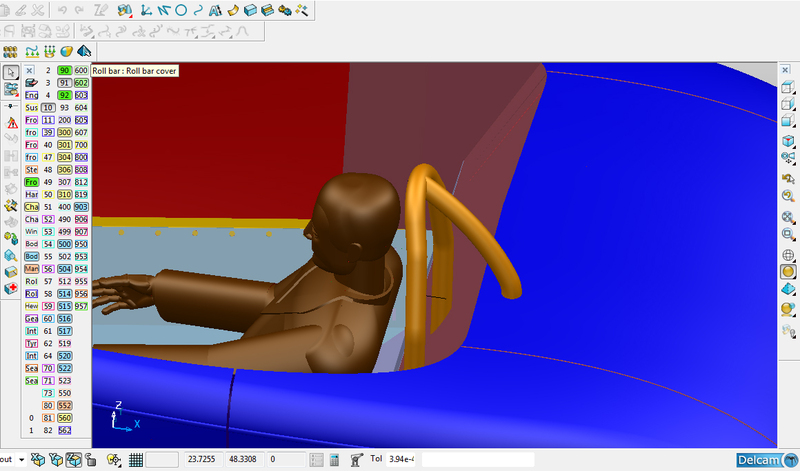 To be able to model the interior of the car firstly we needed a model of a human, using Grab Cad . (check out this site for downloadable models- links to my downloadable models). 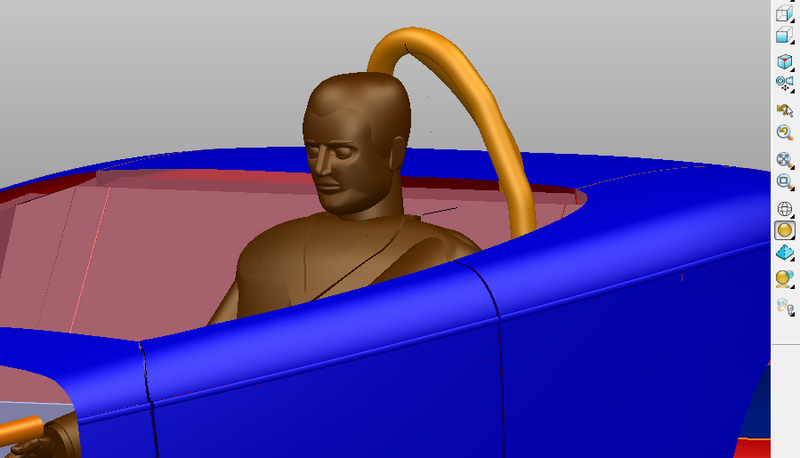 We downloaded a model of a man (could be a woman…) loaded into power-shape cad modeller and checked the height of the model man. It was 6 foot 3″ so we scaled it to both 5foot 7″ and 6foot. Over the Christmas break, decided to look at the hood assembly design. At the moment the body-shell skin is a rough patchwork of surfaces. By this method you can more quickly come up with a basic shapes that you want without all the time needed to ensure that the surfaces are joined and flow together perfectly. Making class A surfaces (perfect surfaces) as you are trying ideas would be very slow and make it more tempting to keep a shapes as they took so long to make. This is a “38 Willy’s” style pickup model with the body skin surfaces redrawing to a class A standard. Rendered using Maxwell Software with an spherical Hdri background which also creates the shadows and reflections on the model. A short post about mould making, as not much time to spend on design work, we are setting up a new development workshop at the moment. If you want to produce any form of low volume production body-shell, composites are the answer. This is because the tooling costs are low. The tooling cost:- the costs of producing a master buck (the shape and style you want) and the tooling (a mould) to produce the parts required from it. In the case of composites, the most common- Glass Reinforced Plastic (Fiber Glass or Glass Fibre dependent on where you live). The cheapest form of this is chopped stand mat wetted out by hand using Polyester resins. 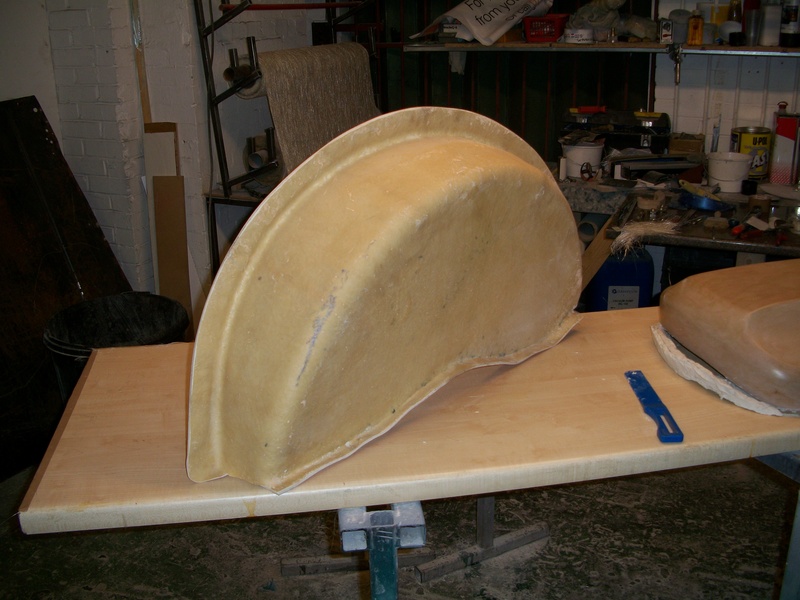 Using this method we have produced 10 different sets of body-shell moulds in the past. Using Polyester resins in wet lay, the main advantage is it’s the cheapest system to use. Be aware that not all polyester resins are of the same quality. Reprocessed resins tend to shrink up to 8% and should be avoided as the shrinkage will cause assembly problems as you complete your project. This is a section of a bodyshell mould modification laid up using Dsm tooling gel and anti shrink resin using the wet lay process. Very messy system but with a little practice anyone can do this. As we are still looking into new dynamic software to check the suspension and ride height system out, still favoring Solid Works premium, but it’s expensive and still do not like the surface modeling side of the package. Therefore would not be using it to model with, so working with the demo to evaluate it at the moment. 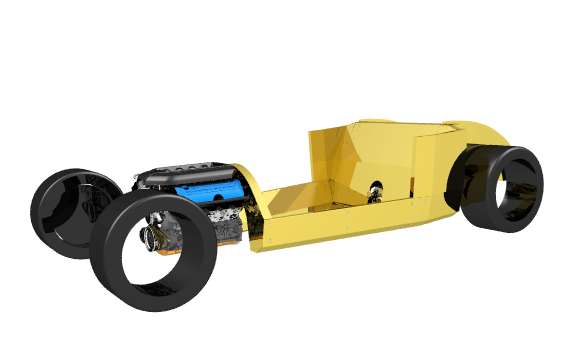 The front suspension design is too complex to ensure that the suspension model will work though all the movements and the changing ride height system adding to the possible movements. 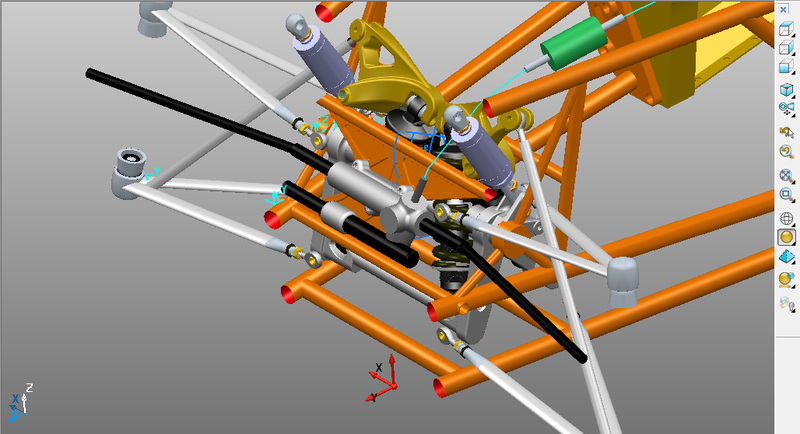 To this end we have been researching 3dCad softwares that can simulate the suspension movements as we now need this capability in-house as the design work progresses to ensure no wasted redesign work later on. 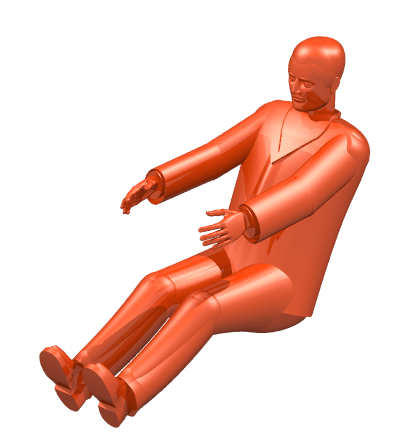 There are many software’s that offer motion simulation as an option. The first is free from AR-Cad click here to view. This is a package that we are going to try out,an adding benefit is this software can resolve force input. This will be useful at the ride height adjusting system change the effective spring rate of the coil-over by changing the angle of the unit. 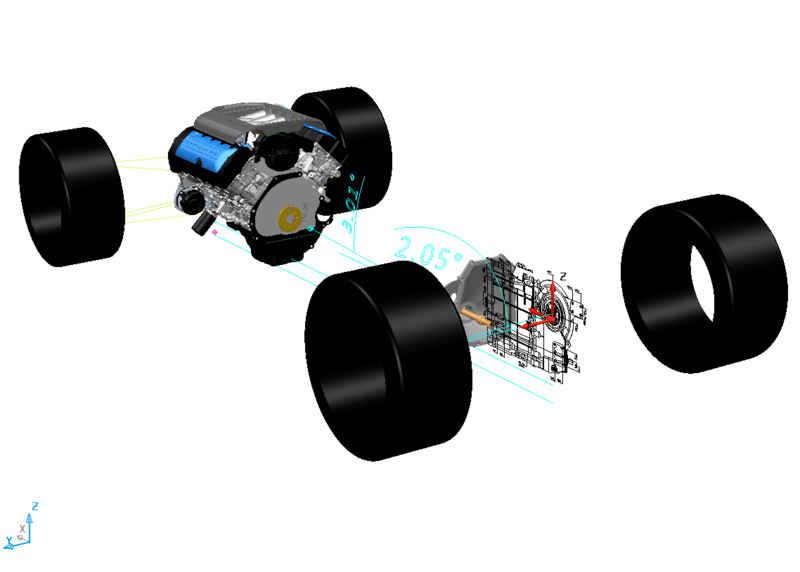 This would enable the change is the ride height to be calculate…..possibly. 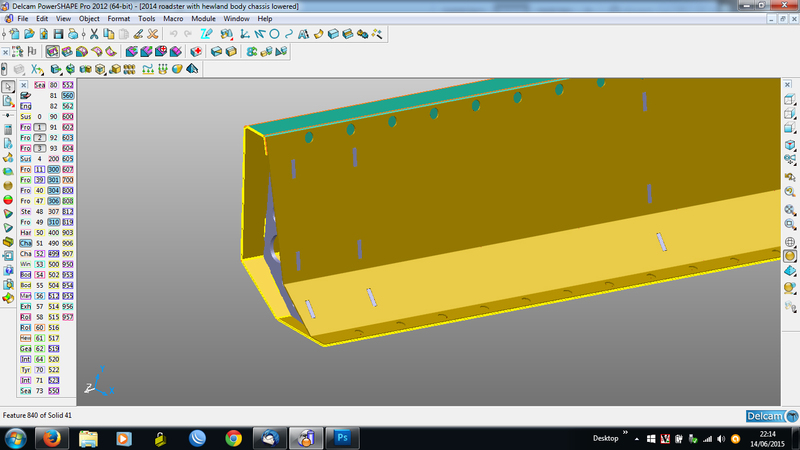 The limitation is the importable models are only simple solids and dxf files. Useful for some basic checking but as the model will simplified not much use for collision detection. Ar-Cad also offer a full 3dCad package which includes the Motion Simulation, a software called SpaceClaim for around $2,500. 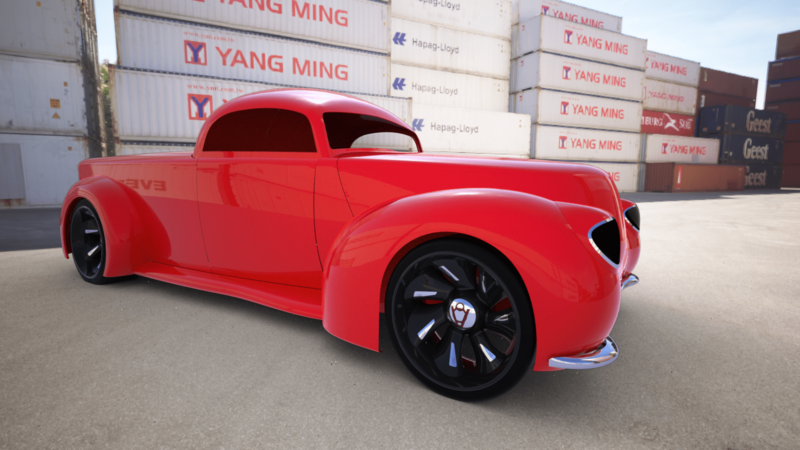 This looks to be a good solid modeller but not sure if you can model with surfaces in it (car bodywork is normally modeled in nurbs surfaces) Click here to visit web page. Will be doing move research into this software as this allows importing of iges/step files allowing the use of more complex models in the simulation. Lastly we are looking again at Rhino3d, the basic modeller is a good surface modeller and there are many plugins to improve this for class A surface work. See previous blog on this (found another useful plugin- A curves click here for details ). For Motion Simulation there is an add on package called bongo click here to visit web page. We are still considering changing to rhino3d for design work as the surfaces produced are nearer class A, but still not sure if the software can produce surfacing as modifiable as Delcam’s power-shape. Need to use it more to find out what it can do. Note they have a 90 day trail period so if you want to try it Click here. 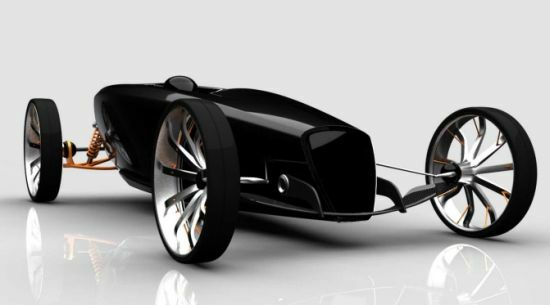 The students of ESPERA Sbarro Montbéliard built this: called the Sbarro Eight hot-rod concept.>click here and here for more info. Sbarro is an auto school that teaches its students, the fine art of car design and car materials. Not sure that I’d want one, but it’s good to see something new and fresh built from the ground up start with a 3d model. It is a shame that only a school in France can inspire their student by allowing them to build something like this. It’s time for some of the American colleges to show their students talents as well as this….. 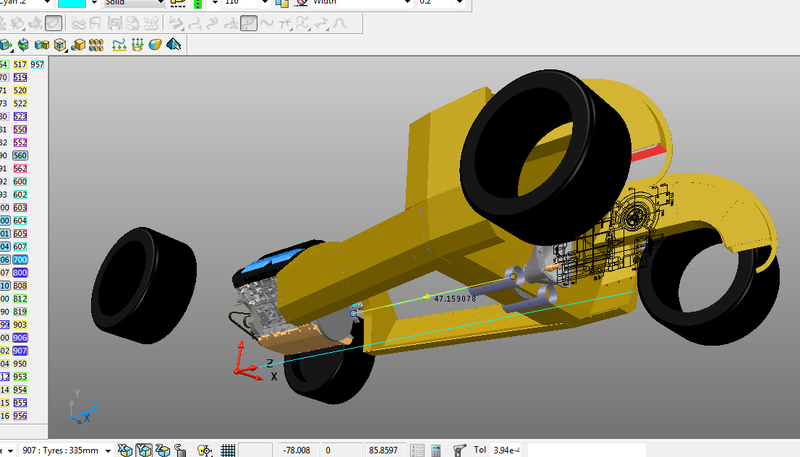 Working on the front suspension system forced some decisions on the design. Variable ride height with soft spring value at the high ride height and stiffer spring value at the lower ride height was add to the design spec. Air bags are the easy option but do not meet our spec, in fact they do the opposite as the spring value increases with ride height. The only way to increase ride height is to increase air pressure hence increase spring rate. The only method possible is a mechanical system which changes the coil spring angle and the effective length. The design in the picture shown my first attempt using a swinging arm to mount the fix chassis end of the coil-overs to. Shows the slots cut into the outer rail for the bulkheads to be welded into. All the holes will be cut using a laser cutting machine before the plate is folded. Shows the plug welding holes to weld the inner cover plate to the outer rail. 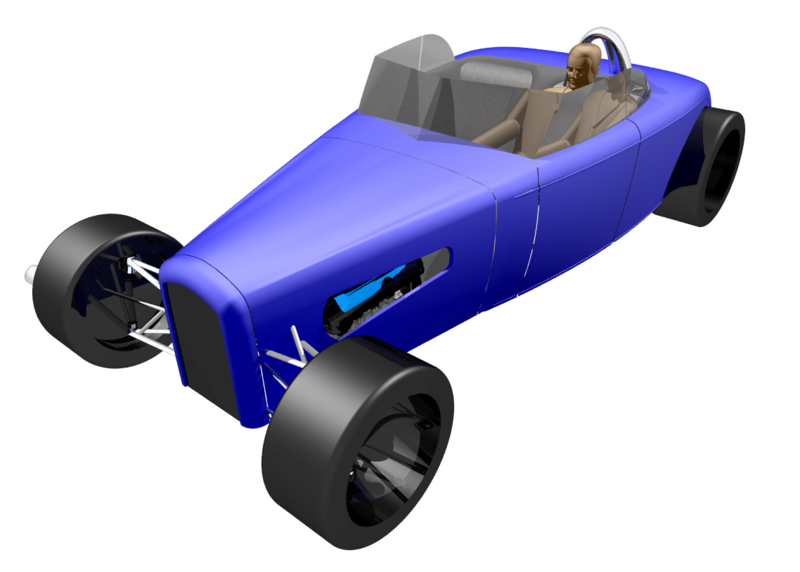 Thinking about changing the rear structure to Carbon Fiber to reduce the weight and make the structure easier to make as it is becoming too complex to fabricate. 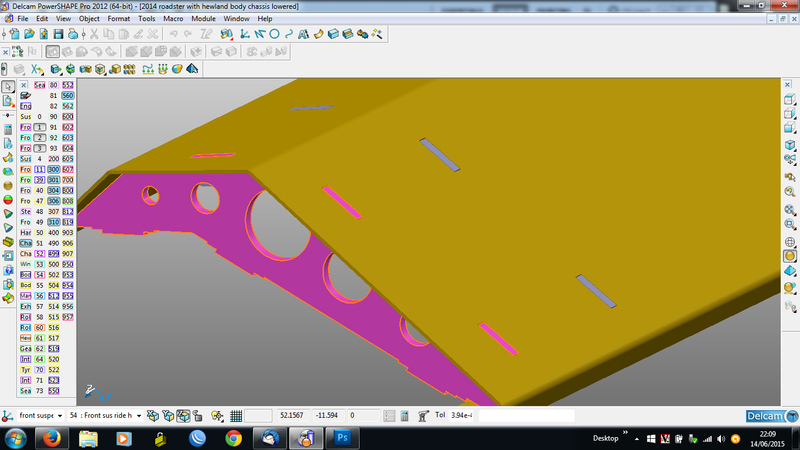 This would entail adding overlapping onto the chassis rails to allow bonding and riveting. 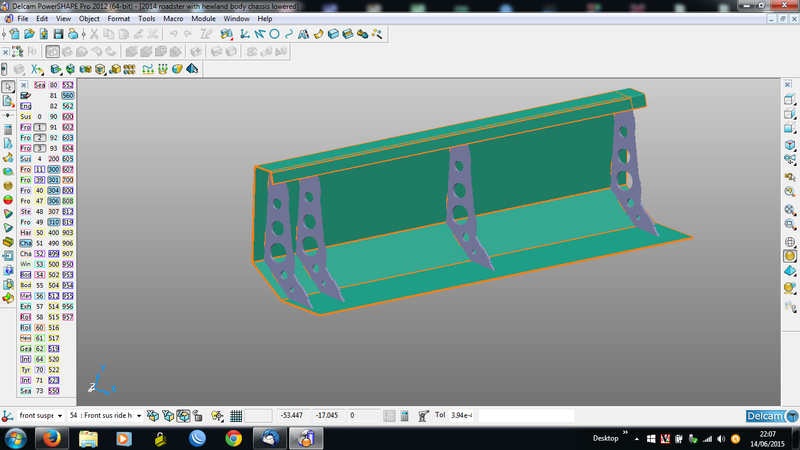 Will work on the chassis rear legs next as the ends of the rails may need to change. 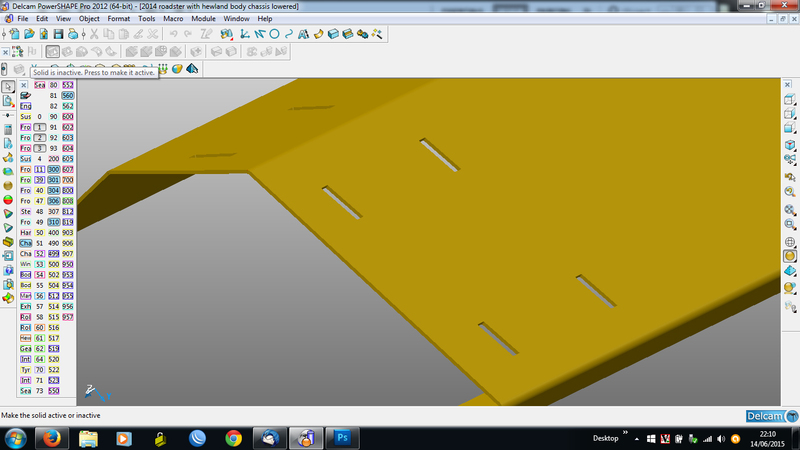 Planing to unfold the chassis rails and produce a 2d dxf file of the chassis rail parts. These files can be send to the laser cutters from which they can produce the parts. 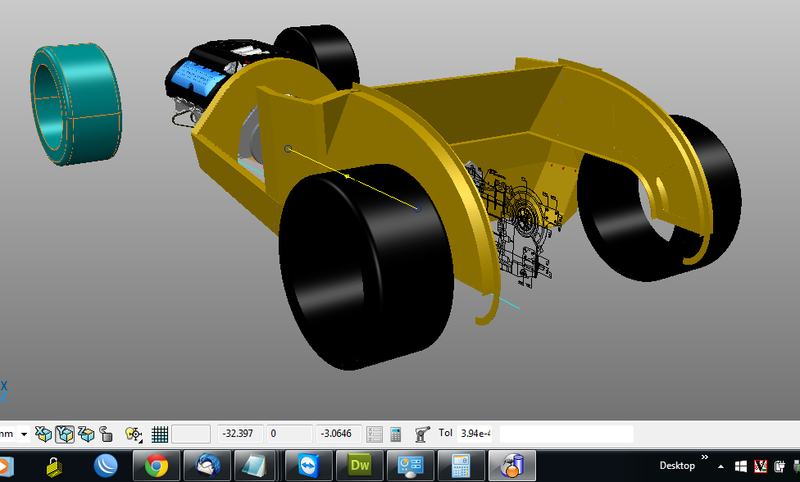 Rear view, the rear chassis area is only conceptual at the moment. It may be too complicated. Over the week end I added fire bug to my fire-fox browser. This allows you to inspect any web page you are viewing and highlight the code and see what css code is acting on it. As a reminder webpage are write in html code and you can use css (cascading style sheet) called a the top of the html code to affect the colors fonts layout of the html web page……………………..the end result I found the classes (something that calls the css style to the html page) for the line height and the margin bottom of each paragraph and changed them as you can see in the posts. Why bother……we are designers and the look of anything bothers us: web pages, hot rods, in fact anything we look at. Still not happy with the look of the blog so started working through the WordPress design your own theme tutorial Click here to visit the webpage it you want to see the code. Just a note to say I am trying to reformat the site to look more like my website. I have experience designing layouts for a html site using css (this is a system using a separate style sheet) but with a blog site you have use a database and php code. At the moment I am not fully understanding the format of a WordPress site. It’s driving me nuts trying to reformat the theme I am using. I will sort this but I am editing it live so bear with me. 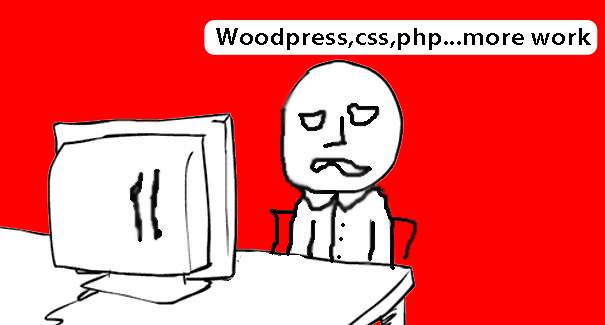 I like the basic set up of WordPress, you can blog with no understanding of code, but if you do have coding knowledge it is not as simple as it should be. Changing a simple thing such as line spacing with code line-height: value; I changed the code in the style.css as I would in a html site, but it still defaults to the original setting. Still have no Idea why. Think I’ll write my own theme. Produce high quality rendering (pictures) from the model to show the customer. Time-line of the project is easy to keep too. Everyone working on the project knows what is expected as they have renderings and the model to refer too. Sub contractors can have accurate 2d drawings of the parts required complete with note directly from the model reducing errors and rework. Bad Styling or Design shows up sooner in the project. Forces you to cost the parts of the project earlier so changes to suit the budget can be made at the start. The only negative is you will need to learn how to use the software, this takes time but even for one project It’s worth it. Or you pay someone like us to do it for you. The end result will be the car will look and work better for it. To save buying the very expensive graphics card at this time, I reduced the poly (triangle) count on the model, this reduced the file size to the point where my existing graphics card can cope. In the future I will purchase a better one as my models are becoming more complex, therefore more graphic card memory capacity is required to rotate the model smoothly. But for now I can use what I have, plus I want to more research into graphics cards. 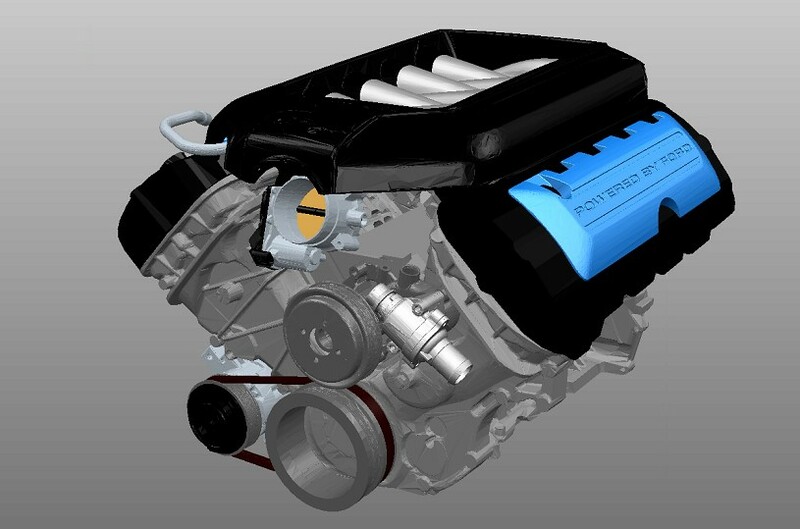 Cad systems requirements are different to games requirement, direct x performance is important. The recommendations are for the workstation cards but they are much more costly than the Pc cards. Working on the 214 roadster, started it in 2014 hence the name. 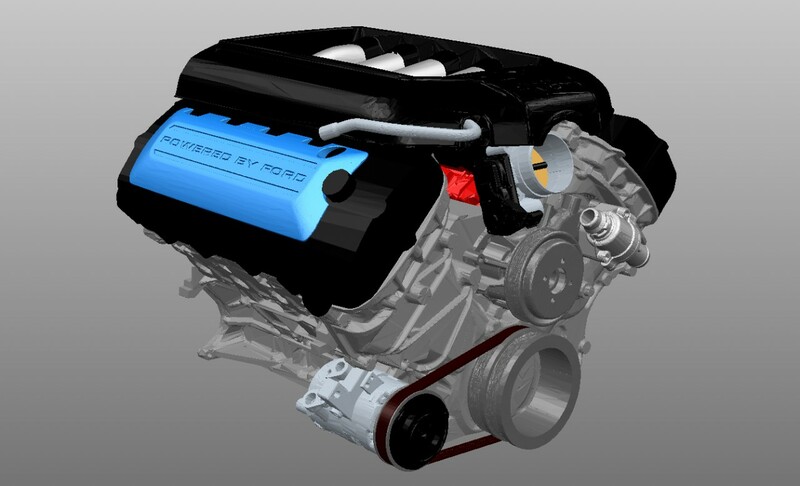 Decided that a small block Chevy is too old hat, so searched the internet for a model of Ford’s new Coyote engine. Finally purchased a very detailed mesh model (triangles), it looks wonderful. There is a but, the file is so large that it slows the screen refresh as you rotate the model. Looking into the Nvidia Quadro M6000 graphic card. Visit the web page , very large sticker shock may I’ll have to look lower down the range.